This vehicle was dubbed the Morden Routemaster, following a design competition promoted by London Mayor Boris Johnson, a contract to produce a new bespoke double deck bus for London was awarded to Wrightbus. The unique design incorporates three passenger entrances and twin staircases and was nicknamed the Borismaster by press. Towards the end of 2013 Transport for London started to refer to the vehicle as the "New Routemaster" in official press releases. Following production of a full size mock up of the vehicle in late 2010, a partly completed engineering prototype was produced in mid 2011 and subjected to a battery of tests at the Millbrook proving ground in Bedfordshire. This vehicle was completed and joined seven other pre-production vehicles on route trials in 2012. All eight vehicles were operated by Arriva London on central London route 38. The first of 600 production vehicles began to enter service during mid 2013. A rolling programme of Central London route conversions is now underway and is set to continue into 2016. 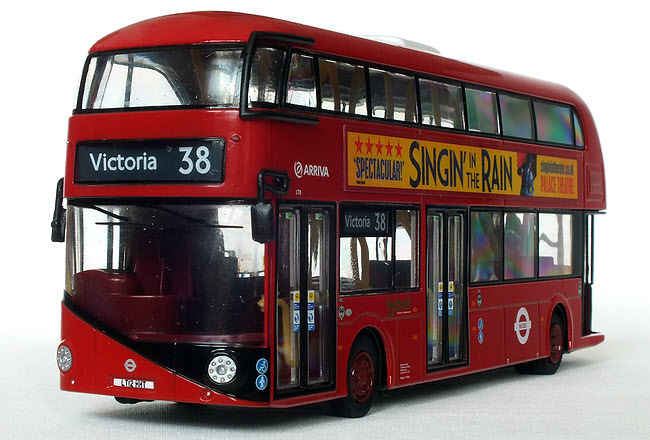 Corgi announced this model in July 2011 as part of it's October 2011 to March 2012 Catalogue. However the model was delayed and the first release didn't appear until August 2012. The model can be produced with the rear doors modelled in either the closed or open position, this feature is noted in the list of models below. During 2014 a second low price model was produced for the Corgi Toys Best of British range, this model is slightly larger than the OOC model and is less detailed, this non-limited version was mainly produced for the London Souvenir market, but the difference in scale between the two versions is hardly noticeable.